Reporting to Screengrab from this year's Cannes Film Festival, Mike D'Angelo stated: "[Olivier] Assayas' latest film, Boarding Gate, doesn't seem to have much of anything on its mind." He concludes, "Assayas never seems remotely invested in this nonsense—not even in a subversive, strictly intellectual way." Without missing a beat and with no pretensions to art, Olivier Assayas seems upfront about just that when he accompanied the film to its recent Pacific Film Archives premiere as part of his "Cahiers du Cinéma Week" residency. Introducing Boarding Gate, Assayas explained: "This movie is, I suppose, different from what I've done previously in the sense that it's an English-language film. I've made movies which are known for mixing languages and mixing cultures; this one is just a straight forward English language. It's also trying hard—no, no, not so hard—but, it's trying at least to be a genuine genre movie. I wanted really to work on a format that is similar to the format of what B-movies used to be. I don't think the movie in that sense is a cinephilic homage to B-movies; I was [more] interested in putting myself in the actual position of making a movie in similar conditions. Meaning, I was trying to make the movie with a tiny, tiny budget—we made the movie with the budget of a small independent French film—and trying to address [not only a] cinephile audience, [but] also modern-day teenage moviegoers. I think that's where the real audience for movies is and I think it's very important to try to keep in contact with [what is] liveliest [in] contemporary movie culture." "I started thinking about the logic of what kind of movies you can make outside of the film industry and not lose the connection with the audience. Because, of course, you can make radical movies that end up in film festivals and a couple of independent theaters here and there; but, the point of making movies is because it's a modern art form and it's the one modern art form that addresses a wide audience, potentially world-wide, and that's what attracts one to be a filmmaker: the capacity of being in touch with a popular form of art. I suppose I thought that maybe one way of making movies is using the logic of the industry and possibly turning it or using it to my advantage in the sense of why not—instead of waiting to get my French movies to happen—why not write really fast something that has some kind of modern B-movie type of energy? The very notion of making a B-movie, of making a genre movie that somehow is a way of getting some oblique passage into the mainstream? Using some of the syntax of mainstream filmmaking, but still ultimately using the freedom to get in that space. I think you can have a lot of freedom ultimately if you make movies on a much smaller budget. But that's not really what I wanted to talk about. [Laughs.] Because I end up talking about the economic logic of the film instead of about making a film because at some point there's a story you want to tell, because you meet an actress, because there's something within you that makes you try to express those feelings, and try to make that specific movie happen." After watching Asia Argento go through her (at times preposterous, alternately perverse) paces in Boarding Gate, and being left with anything but a resolution at film's end, I had to ask: "I can understand what you're saying about the economic parameters of a B-film; but, what I'm not quite understanding is—if you had the money—what would have made this an A-film?" Assayas responded emphatically: "This is not an A-film! This movie has a completely coherent logic for me. Part of the fun of making this film was because it was designed and imagined as something that had to be done this fast. We shot this in 28-29 days and we had various locations in Paris and we shot a lot of it in the streets of Hong Kong. The film was written having in mind that it was to be done on a small budget. If I had had a lot of money, I don't know where I would have spent it on this film." I persisted: "By your definitions of a B-film or a genre film, then, what characterizes Boarding Gate as a B-film? Is it the pace of it? The right-sizedness of it?" "The way I see it," Assayas indulged me, "is making a genre movie with a small budget, meaning filling in for the small budget with some energy, style, and hopefully visual convention. Again, today's genre movies are made with huge budgets in Hollywood, with smaller budgets in Europe but still they are very expensive films because they involve stunts, CGI, or whatever. Here is a movie that has no special effects, no big sets, no car chases. Again, I'm playing with the codes of the genre film but I'm playing on a very small scale. I'm trying to find something which I am looking for, which is the energy and the physical relationships somehow with the viewer. If there is something that I ultimately miss in a lot of independent cinema I see, it is the lack of physical relationship with the viewer. Whereas, extremely bad, dull, conventional genre or Hollywood/French filmmaking deal with that physical relationship and ultimately I think there's a way of not losing that, of making an eventful film but still try to keep that physical connection." 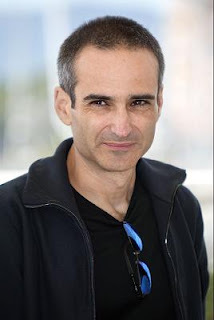 I can't say that satisfied my question; but, it did guide me to be more attentive to the responses of others who have written about Assayas and his past and more recent work. Max Goldberg's sterling Guardian write-up on the Assayas residency speaks of the filmmaker's "hyperkinetic narration" and the "restless confusion" that animates his films. And Premiere's Glenn Kenny refutes the futility of resistance by standing up to compatriots who didn't much care for Boarding Gate, proudly proclaiming the film "rocked" him hard, and appreciatively detailing the "tossed salad of signifiers that is both the casting and the play on genre." Not the least of which is "the unforgettable spectacle of Sonic Youth's [Kim] Gordon barking orders at a pack of low-level gangsters in sharp Cantonese." Kenny concludes: "This is very much a French intellectual cineaste's idea of a B thriller and hence is as far from innocent in its genre as you can get. Which is not to say that Assayas deals in bad faith. There are some genuinely frisson-inducing twists, and he does wrap up the plot pretty neatly despite giving every indication that he's not going to." Dave Hudson at The Greencine Daily has gathered up the rest of the Cannes reviews. Eurotrash is dead. Long live Eurotrash! This is another film that I'd really hoped would show up at TIFF. I've only seen four or five of Assayas's films and don't consider myself a devoted fan, but he's always interesting, and the talk of a B-movie sensibility here (not to mention Kim Gordon speaking Chinese) has really piqued my curiosity. Michael, have you seen Irma Vep? It's a remarkable film. Irma Vep was my first exposure to both Assayas and Maggie Cheung who--to copy Glenn Kenny--rocked me. I agree, it's a great movie, and remains my favorite of his works. I was hoping to catch it one more time to hear Assayas' comments; but, got tied in to another obligation. There's so much going on in the Bay Area this week, it's phenomenal! His comments on Irma Vep were great. I didn't bring my recorder but here's a bit from my memory. He talked a lot about his transition from critic to filmmaker. Irma Vep seems to be a way for him to get a widely diverse range of influences (among them: silent serials, Isadore Isou, the New Wave, Guy Debord, Hong Kong action cinema, and of course Beware of the Holy Whore) and ideas of what cinema should be up on the screen at once. He talked of writing it extraordinarily quickly. Originally it was to be a segment of a triptych by three directors, the others being Atom Egoyan and Claire Denis (whose Trouble Every Day eventually came from the same starting point) but he worked so fast and put so much into it, that he had to cut himself loose from that original concept (though he cast Egoyan's wife in the film of course. In what may be the film's most enigmatic scene, actually). This was only my second Assayas film after demonlover, which had done nothing but baffle me. It would have been terrific to see it again with Assayas on hand to help make sense of it, perhaps. Or any of the other films in the series (I heard Cold Water was just fantastic). Too bad I could only make the one night. But what a terrific film! Brian, what a generous contribution to this entry; thank you so much!! I too regret being able to catch only one of the programs. I could have gone over tonight, I guess, but he wasn't going to be there and I was feeling a bit worn. Besides, I had another damn interview to transcribe. My so-called life. Heh.